List of Applicants Found Eligible for Draw for Selection of LPG Distributor for TELANGANA(Re Advertisement). List of Applicants Found Eligible for Draw for Selection of LPG Distributor for ASSAM (Re Advertisement). List of Applicants Found Eligible for Draw for Selection of LPG Distributor for MAHARASHTRA (Re Advertisement). List of Applicants Found Eligible for Draw for Selection of LPG Distributor for GOA (Re Advertisement). List of Applicants Found Eligible for Draw for Selection of LPG Distributor for TAMIL NADU (Re Advertisement). List of Applicants Found Eligible for Draw for Selection of LPG Distributor for BIHAR (Re Advertisement). List of Applicants Found Eligible for Draw for Selection of LPG Distributor for JHARKHAND (Re Advertisement). List of Applicants Found Eligible for Draw for Selection of LPG Distributor for GUJARAT (Re Advertisement). List of Applicants Found Eligible for Draw for Selection of LPG Distributor for RAJASTHAN (Re Advertisement). List of Applicants Found Eligible for Draw for Selection of LPG Distributor for CHHATTISGARH (Re Advertisement). List of Applicants Found Eligible for Draw for Selection of LPG Distributor for MADHYA PRADESH (Re Advertisement). List of Applicants Found Eligible for Draw for Selection of LPG Distributor for ANDHRA PRADESH (Re Advertisement). List of Applicants Found Eligible for Draw for Selection of LPG Distributor for UTTARAKHAND (Re-Advertisement). List of Applicants Found Eligible for Draw for Selection of LPG Distributor for Punjab (Re-Advertisement). List of Applicants Found Eligible for Draw for Selection of LPG Distributor for Assam (Re-Advertisement). List of Applicants Found Eligible for Draw for Selection of LPG Distributor for GUJARAT (Re-Advertisement). List of Applicants Found Eligible for Draw for Selection of LPG Distributor for Sikkim (Re-Advertisement). List of Applicants Found Eligible for Draw for Selection of LPG Distributor for UTTAR PRADESH (Re-Advertisement). List of Applicants Found Eligible for Draw for Selection of LPG Distributor for West Bengal (Re-Advertisement). List of Applicants Found Eligible for Draw for Selection of LPG Distributor for Himachal Pradesh (Re-Advertisement). List of Applicants Found Eligible for Draw for Selection of LPG Distributor for JHARKHAND (Re-Advertisement). Last date for submission of online applications for Sikkim (Re-Adv) has been extended to Monday, 10-12-2018. Last date for submission of online applications for West Bangal (Re-Adv) has been extended to Friday, 30-11-2018. List of Applicants Found Eligible for Draw for Selection of LPG Distributor for JAMMU & KASHMIR (Re Advertisement). List of Applicants Found Eligible for Draw for Selection of LPG Distributor for TELENGANA (Re Advertisement). 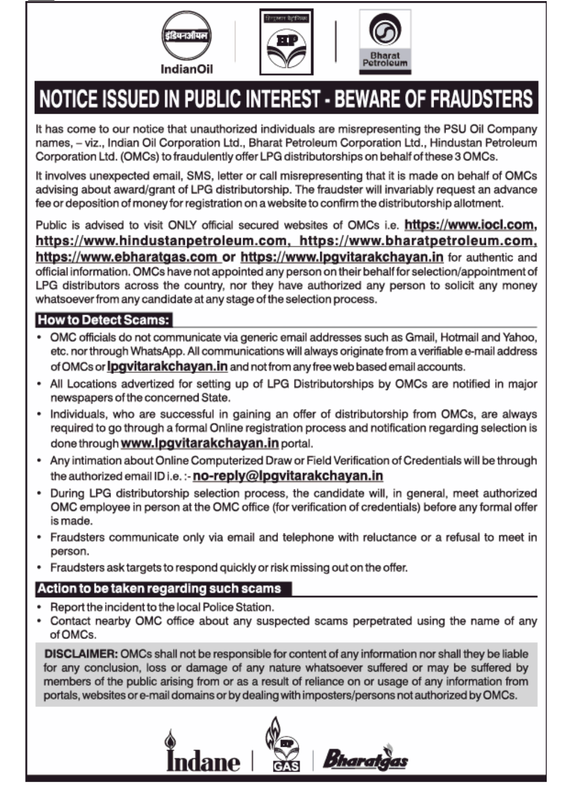 List of Applicants Found Eligible for Draw for Selection of LPG Distributor for HIMACHAL PRADESH (Re Advertisement). List of Applicants Found Eligible for Draw for Selection of LPG Distributor for Nagaland (Re Advertisement). List of Applicants Found Eligible for Draw for Selection of LPG Distributor for Arunachal Pradesh (Re Advertisement). List of Applicants Found Eligible for Draw for Selection of LPG Distributor for Meghalaya (Re Advertisement). List of Applicants Found Eligible for Draw for Selection of LPG Distributor for ANDAMAN AND NICOBAR ISLANDS(Re Advertisement). List of Applicants Found Eligible for Draw for Selection of LPG Distributor for KERLA (Re-Advertisement). List of Applicants Found Eligible for Draw for Selection of LPG Distributor for BIHAR (Re-Advertisement). List of Applicants Found Eligible for Draw for Selection of LPG Distributor for MANIPUR (Re-Adv). List of Applicants Found Eligible for Draw for Selection of LPG Distributor for NAGALAND (Re-Adv). List of Applicants Found Eligible for Draw for Selection of LPG Distributor for MEGHALAYA (Re-Adv). List of Applicants Found Eligible for Draw for Selection of LPG Distributor for TRIPURA (Re-Adv). List of Applicants Found Eligible for Draw for Selection of LPG Distributor for ARUNACHAL PRADESH (Re-Adv). List of Applicants Found Eligible for Draw for Selection of LPG Distributor for MADHYA PRADESH (Re-Adv). List of Applicants Found Eligible for Draw for Selection of LPG Distributor for CHHATTISGARH (Re-Adv). List of Applicants Found Eligible for Draw for Selection of LPG Distributor for ASSAM (Advertisement 2). List of Applicants Found Eligible for Draw for Selection of LPG Distributor for ASSAM. List of Applicants Found Eligible for Draw for Selection of LPG Distributor for MADHYA PRADESH (New). List of Applicants Found Eligible for Draw for Selection of LPG Distributor for ODISHA (Re Advertisement). List of Applicants Found Eligible for Draw for Selection of LPG Distributor for SIKKIM (Re Advertisement). List of Applicants Found Eligible for Draw for Selection of LPG Distributor for ANDAMAN AND NICOBAR (Re Advertisement). List of Applicants Found Eligible for Draw for Selection of LPG Distributor for WEST BENGAL (Re Advertisement). List of Applicants Found Eligible for Draw for Selection of LPG Distributor for KERALA (Re Advertisement). List of Applicants Found Eligible for Draw for Selection of LPG Distributor for RAJASTHAN (Re-Advertisement). List of Applicants Found Eligible for Draw for Selection of LPG Distributor for UTTARAKHAND (Re Advertisement). List of Applicants Found Eligible for Draw for Selection of LPG Distributor for MANIPUR (Re Advertisement). List of Applicants Found Eligible for Draw for Selection of LPG Distributor for TRIPURA (Re Advertisement). List of Applicants Found Eligible for Draw for Selection of LPG Distributor for BIHAR (Advertisement 3). List of Applicants Found Eligible for Draw for Selection of LPG Distributor for KERALA. List of Applicants Found Eligible for Draw for Selection of LPG Distributor for MEGHALAYA. List of Applicants Found Eligible for Draw for Selection of LPG Distributor for UTTAR PRADESH - Advertisement 2. List of Applicants Found Eligible for Draw for Selection of LPG Distributor for ANDHRA PRADESH. List of Applicants Found Eligible for Draw for Selection of LPG Distributor for WEST BENGAL. List of Applicants Found Eligible for Draw for Selection of LPG Distributor for SIKKIM. List of Applicants Found Eligible for Draw for Selection of LPG Distributor for JAMMU AND KASHMIR. List of Applicants Found Eligible for Draw for Selection of LPG Distributor for JHARKHAND. List of Applicants Found Eligible for Draw for Selection of LPG Distributor for NAGALAND. List of Applicants Found Eligible for Draw for Selection of LPG Distributor for MANIPUR. List of Applicants Found Eligible for Draw for Selection of LPG Distributor for MIZORAM. List of Applicants Found Eligible for Draw for Selection of LPG Distributor for TELANGANA. List of Applicants Found Eligible for Draw for Selection of LPG Distributor for KARNATAKA. List of Applicants Found Eligible for Draw for Selection of LPG Distributor for GOA. List of Applicants Found Eligible for Draw for Selection of LPG Distributor for MAHARASHTRA. List of Applicants Found Eligible for Draw for Selection of LPG Distributor for MADHYA PRADESH. List of Applicants Found Eligible for Draw for Selection of LPG Distributor for RAJASTHAN. List of Applicants Found Eligible for Draw for Selection of LPG Distributor for TAMIL NADU. List of Applicants Found Eligible for Draw for Selection of LPG Distributor for TRIPURA. List of Applicants Found Eligible for Draw for Selection of LPG Distributor for ARUNACHAL PRADESH. List of Applicants Found Eligible for Draw for Selection of LPG Distributor for BIHAR (Advertisement 2). List of Applicants Found Eligible for Draw for Selection of LPG Distributor for CHHATTISGARH. List of Applicants Found Eligible for Draw for Selection of LPG Distributor for HARYANA. List of Applicants Found Eligible for Draw for Selection of LPG Distributor for HIMACHAL PRADESH. List of Applicants Found Eligible for Draw for Selection of LPG Distributor for GUJRAT. List of Applicants Found Eligible for Draw for Selection of LPG Distributor for DADRA AND NAGAR HAVELI. List of Applicants Found Eligible for Draw for Selection of LPG Distributor for BIHAR (Advertisement 1). List of Applicants Found Eligible for Draw for Selection of LPG Distributor for Uttar Pradesh. List of Applicants Found Eligible for Draw for Selection of LPG Distributor for Uttarakhand. List of Applicants Found Eligible for Draw for Selection of LPG Distributor for Punjab. For any query or complaint regarding the selection of LPG Distributors appearing on this website please send email to support@lpgvitarakchayan.in or contact concerned Area Office (IOC) / Territory Office (BPC) / Regional Office (HPC). Details are given in the link available below. Network expansion has been an important business activity of PSU Oil Marketing Companies (OMCs) for increasing the reach of petroleum products including LPG across the country. OMCs are engaged in appointing new LPG Distributors as a continuous business process and providing accessibility of LPG to households. It has come to our notice that some unscrupulous agencies/persons are fraudulently offering false business opportunities for appointment of LPG distributors for Prime Minister Ujwala Yojana or under the erstwhile Rajeev Gandhi Gramin LPG Vitarak Yojana (RGGLV) Scheme of the Public Sector Oil Marketing Companies. It has been reported in some cases that the fraudulent websites namely www.ujjwaladealer.com, www.lpgvitarakchayan.org, www.ujjwalalpgvitarak.org is referring to their Registered office as UJJWALARGGLV_YOJANA, Ujjwala Apartment M G Road Kandivali West Mumbai Maharashtra 400067. Fraudulent Emails are being sent from an Email Id : info@ujjwaladealer.com. These bogus agencies / Emails may be conducting telephonic interviews, claiming money from prospective candidates and advising to deposit certain amount in their account. The Pradhanmantri Ujwala Yojana (PMUY) scheme does not envisage opening of separate LPG Distributorships exclusively for the scheme. The advertisements purportedly in the name of “Prime Minister’s Ujwala Yojana and/or Rajiv Gandhi LPG Distributorship Plan for rural areas (RGGLV) Scheme and/or PMUDY’ as mentioned in the fake website does not pertain to any Scheme or appointment of any LPG Distributorship of the Public Sector Oil Marketing Companies. The website operated by vested people, with MOP&NG PMUY logo and Hon’ble Prime Minister’s photo, Public Sector Oil Marketing Companies’ product logo on the website, is fake, malicious and is intended to defraud gullible people. It may please be noted that appointment of LPG distributors by the Public Sector Oil Marketing Companies for distribution of LPG is carried out across the country through a well-established selection procedure comprising of detailed advertisement published in leading Newspapers, hosting on internet site of the Public Sector Oil Marketing Companies and conducting draw of lot out of all eligible applicants. None of the Public Sector Oil Marketing Companies have appointed any agency/person on their behalf for selection/appointment of LPG distributors across the country, nor they have authorized any agency/person to solicit any money whatsoever from any candidate at any stage of the selection process. The Public Sector Oil Marketing Companies shall not be responsible in any way for amount paid by the individuals to any individual or group of individuals/agencies/Companies purporting to be representing Public Sector Oil Marketing Companies. Copyright © LPG Vitarak Chayan. All rights reserved. ** SC/ST candidates applying for Open category under Sheheri Vitrak & Rurban Vitrak locations mentioned in the advertisement / notification can submit non-refundable application fee of Rs. 3,000 (Rupees three thousand only). However, candidates belonging to OBC category but applying for “Open” category locations shall submit Application fee applicable to “Open” candidates. **SC/ST candidates applying for Open category Gramin Vitrak & Durgam Kshetriya Vitrak locations can submit non-refundable application fee of Rs. 2,500 (Rupees two thousand five hundred only). However, candidates belonging to OBC category but applying for “Open” category locations shall submit Application fee applicable to “Open” candidates. The candidates are requested to refer to the brochure for further details. Regarding the procedure for filling up application forms, candidates are requested to read carefully ‘User manual for Applicants – LPG VITARAK CHAYAN’ which is available at the portal www.lpgvitarakchayan.in, before filling up the online application form. After submission of the online application, no document or printout of the application form is required to be submitted in the physical form to any office, unless requested. Later, if the candidate is selected in the draw of lots, the selected candidate shall produce the prescribed eligibility certificate(s) as applicable at the time of verification. Applicants applying under Defence Personal category shall submit the original eligibility certificate from Directorate General Resettlement (DGR) within the time limit as stipulated in the Brochure. For details please refer to the Brochure. a. Indian Oil Corporation Ltd., Bharat Petroleum Corporation Ltd., or Hindustan Petroleum Corporation Ltd. reserves the right to cancel/withdraw/ amend the advertisement or extend the due date of submission of application forms at its sole discretion without assigning any reason. b. While application by a candidate can be made for different locations, the same should be done by submitting separate online application forms for each location, along with applicable non refundable application fee in each case. Applicants can submit only one application for a location. c. If any statement made in the application or in the documents subsequently submitted in pursuance of the application by the candidate, at any stage is found to have been suppressed / misrepresented / incorrect or false affecting eligibility, then the application is liable to be rejected without assigning any reason and in case the applicant has been appointed as a distributor, the distributorship is liable to be terminated and the non refundable application fee will be forfeited. In such cases the candidate / distributor shall have no claim whatsoever against the respective Oil Company. d. The submission of application form should not be construed as an offer of LPG Distributorship. e. All correspondence will be made by the portal www.lpgvitarakchayan.inthrough Email and / or SMS to the candidate’s registered email ID or Registered phone number. f. This is purely a business proposition and not an application for job in the respective Oil Company and has normal business risks and also does not guarantee any assured returns or profits. g. If there is any discrepancy found in the Advertisement published in English, if any, vis-a-vis vernacular language, the directions/information indicated in vernacular version would prevail. h. In case of discrepancy in the details appearing on the website www.lpgvitarakchayan.invis-à-vis’ the advertisement / notification, the details appearing in the published advertisement / notification would prevail. i. Indian Oil Corporation Ltd., Bharat Petroleum Corporation Ltd., or Hindustan Petroleum Corporation Ltd. will not be responsible for any amount deducted from applicant’s bank account/debit card account/ credit card account which has not been transferred or credited to the respective bank account of the concerned Oil Company. j. Indian Oil Corporation Ltd., Bharat Petroleum Corporation Ltd., or Hindustan Petroleum Corporation Ltd. is not responsible for refunding any excess amount paid online by the applicant, for an application, from his/her bank account/debit card account/ credit card account. OBC (GP) - Government Personnel category consists of Defence Personnel, Central/State Government Employees and Central/State PSU employees, belonging to OBC Category.